Cat and dog lovers rejoice! 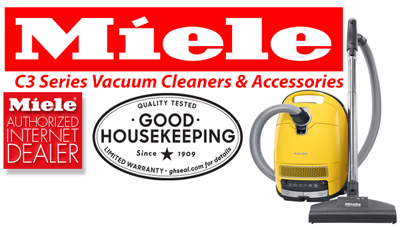 The newest version of the Miele Cat & Dog C3 Complete vacuum is here and it's better than ever. Featuring all the great things people love about the new C3 series, the Complete C3 Cat & Dog Miele pet vacuum cleaner comes with several options put together in a special package for homes with shedding pets. Utilizing the most powerful brush system they have ever produced, the Miele SEB228 Power Brush plows through mountains of pet hair and is a lightweight breeze to push on wall-to-wall carpet. The new Miele Vortex motor creates loads of suction, producing over 140 cubic feet of airflow- enough suction to handle even multiple-pet households. 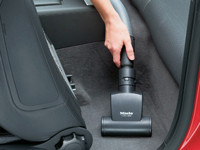 The included Active Air Odor Filter eliminates those smelly pet odors from the vacuum exhaust buy using a quarter-pound of active charcoal to leave your home smelling fresh and clean. 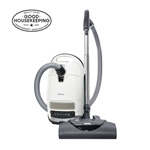 And for people who love their pets but are allergic, The S8 Cat & Dog is available with the optional HEPA Air Clean sealed system that keeps pet dander and allergens out of your air and sealed in the vacuum where they belong. A special handheld turbo attachment is included. The STB101 Mini Turbo's compact design makes it easy to get into hard-to-reach places and whisks away pet hair from furniture and stairs. All the features of the standard S8 models are included- lightweight "skeleton" construction, solid rubber bumper protector, built-in tool compartment and toe tap suction controls.